The Lettered Olive, (Oliva sayana,) was designated the official shell of the State by Act No. 360, 1984. Dr. Edmund Ravenel of Charleston, South Carolina, an early pioneer in concholgy, found and named the Lettered Olive shell which is quite prolific along the South Carolina Coast. 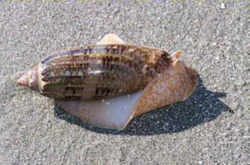 Shells of the family Olividae tend to be cylindrical, smooth and shiny, and variously patterned with numerous fine wrinkles. The lettered olive is an attractive cream or tan colored shell with 5 or 6 whorls and distinct suturing. The spire is fairly low; the aperture is long, smooth, and without teeth; and, the columella shows folds. 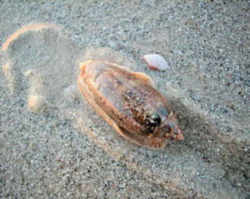 Like many gastropods, these molluscs maintain a highly polished shell, by pulling their mantle flaps over the exposed surface. Many specimens have purple zigzag patterns and purple outer lips. Olives are approximately 66mm in length and 20mm wide. All members of the Olividae family are carnivorous sand-burrowers. Although in a different superfamily than the Muricidae, the Olividae secrete a similar mucus from which a purple dye can be made (Monfils, 2001) They are distributed in warm and tropical seas. 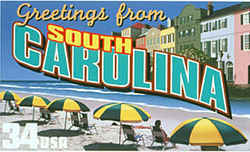 South Carolina State by Act No. 360, 1984. TO AMEND THE CODE OF LAWS OF SOUTH CAROLINA, 1976, BY ADDING SECTIONS 1-1-680, 1-1-690, AND 1-1-695, SO AS TO PROMOTE THE AGRICULTURAL INDUSTRY OF SOUTH CAROLINA BY DESIGNATING THE PEACH AS THE OFFICIAL FRUIT OF THE STATE, MILK AS THE OFFICIAL STATE BEVERAGE, AND THE LETTERED OLIVE AS THE OFFICIAL STATE SEASHELL. (4) Peach production forecasts indicate that by 1985 South Carolina will produce more fresh peaches than any other state in the nation, which will give a tremendous boost to the state's economy. "Section 1-1-680. The peach is the official fruit of the State." (6) The dairy industry in this State represents a one hundred million dollar enterprise. "Section 1-1-690. Milk is the official state beverage." 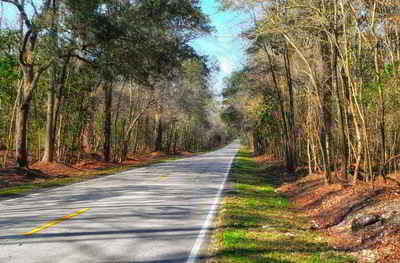 (1) South Carolina's coastal area is one of the most widely promoted areas in the State for recreation and tourism. (2) Shelling along the beaches of South Carolina is becoming increasingly popular among residents as well as with the tourist trade. It is a form of recreation which can be enjoyed by a wide spectrum of the population. 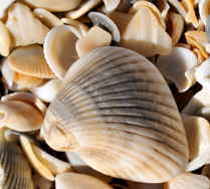 (3) The Lettered Olive shell is quite prolific along the South Carolina coast and will make the finding of the shell more meaningful for South Carolinians, tourists, and shell collectors. (4) The Lettered Olive was found and named by a South Carolinian, Dr. Edmund Ravenel of Charleston, who was an early pioneer in conchology. This name was given to this shell because of its hieroglyphic type markings. "Section 1-1-695. The Lettered Olive, Oliva sayana, is the official shell of the State." SECTION 7. This act shall take effect upon approval by the Governor. The law designating the Lettered Olive, as the official South Carolina state shell is found in the South Carolina Code of Laws, Title 1, Chapter 1, Article 9, Section 1-1-695. SECTION 1-1-695. 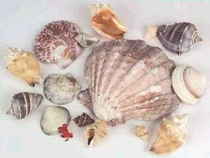 Official State shell. The Lettered Olive, Oliva sayana, is the official shell of the State.